Does your community – region, town, city, school – host an annual International Festival? 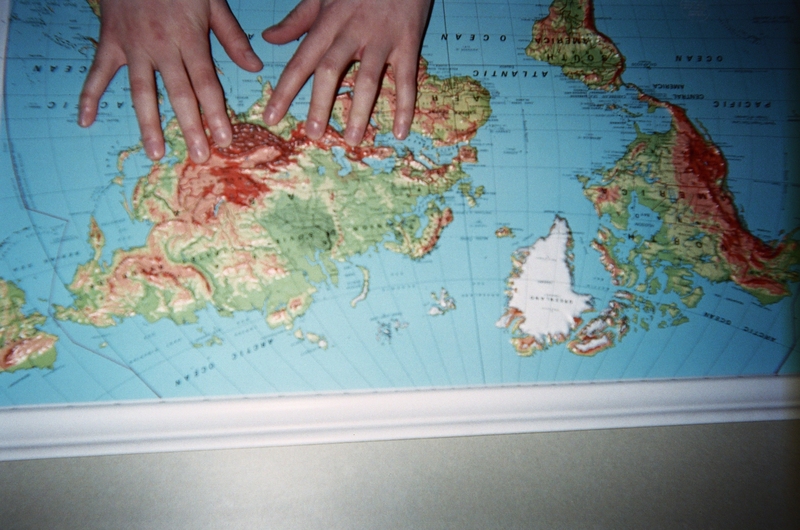 International festivals put the world at your fingertips! like the teacher’s hands in my blog pic here. I enjoy attending festivals that feature different countries and cultures. Displays of national flags, photographs, traditional clothing, jewelry, arts, crafts and cuisines help international festival-goers learn about diverse cultures. NOTE: If your class takes field trips see if an international festival is scheduled within traveling distance this school year. Perhaps you can plan to attend one. The displays are colorful and inviting, but I learn the most from listening to people tell stories about themselves and their homelands. 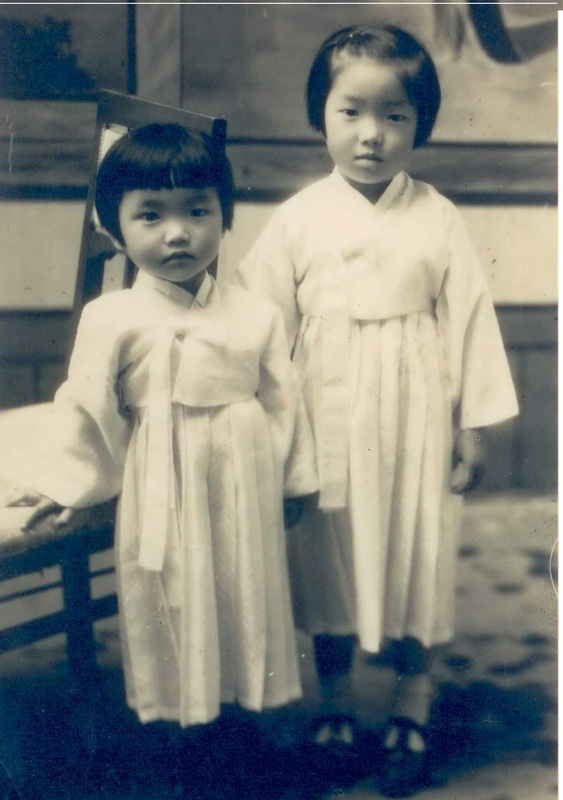 has grown since she was a little girl, as shown in my blog pic here with her younger sister, Eun Hee Yoon. Sunny was born in North Korea in a town called Whag Hea Do (pronounced in English as Hung Hey Do). 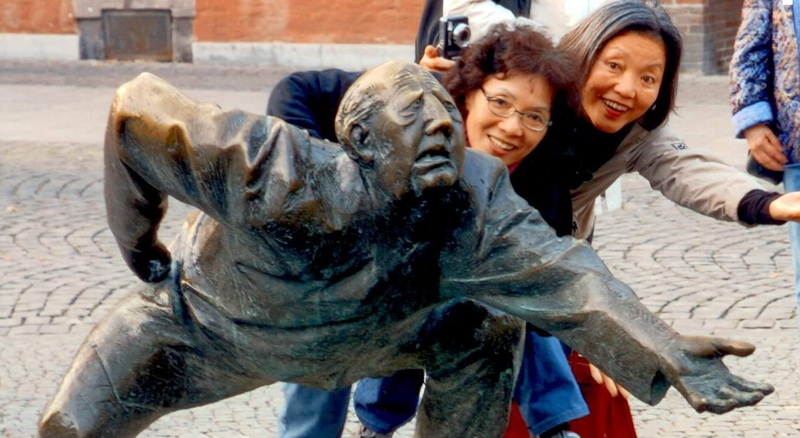 Her family moved to South Korea in 1951. Sunny’s father worked for the government and she and her siblings grew up in Seoul. Sunny catches people’s attention today in much the same way as her third grade music and dance teacher, Yum Young Soon, did when Sunny was a young student. Yum Young Soon is now over 80-years old! Music and movement held Sunny’s attention. “We were in dance class two times a week; I loved to sing and dance,” Sunny remembers. Her Sun Sang Nim played organ and piano. “We were a poor country when I was a little girl. We didn’t have many musical instruments.” Sun Sang Nim played and sang, all the while asking the children to follow the lyrics. And, you don’t have to be professionally trained in music and dance to incorporate these disciplines into your instruction. Select the math concepts from your curriculum that will be the focus of this activity. Teach or review the concepts, using strategies you know to be effective. Introduce the Dancing Numbers activity, telling your class that you want to “play with” (or further review, depending on grade level) the math concept that’s the focus of your lesson. Step One – Using the board so that everyone can see, write a short song (silly or serious – choose what best suits your students) about the math concept. Sample song for grades 1 – 2: Zero is a lonely number/The number one’s a lot more fun/One and one make two/So the numbers grow/Add them up higher and higher/So the numbers grow. Step Two – Make up a simple melody or use a familiar one to set the lyrics to music. Ask the class to sing with you, repeating the lyrics you’ve written on the board. Step Three – Invite the kids to stand up and move their arms to the music and song, following your lead. Drop your arms down low and make a zero with your thumb and index finger. Slowly start to bring your arms up higher; make the number one with one index finger. Make “ones” with both index fingers and bring them together to make “two” as you raise your arms higher…and so on. Step Four – Improvise as you and your class sing and move to master key math concepts with this attentionology trick. Back to our visit with Sunny…Some of her music and dance instruction was for special occasions. “I remember five other girls and me having to learn a new dance for a big anniversary celebration at our school, Donam Elementary School,” says Sunny. Sunny also enjoys international travel. As an adult she has toured many European countries with her sister, shown in my blog pic below on a visit near the French-German border. Hands across the ocean. Sunny (center) and her sister appear much happier than the sculptured man! Sunny’s (and her sister’s) happy manner and sense of humor are evident. Maintaining a “sunny” disposition, even in the face of adversity, adds strength to any teacher’s ability to catch and keep kids’ attention. walls of ignorance and fear. seeking acceptance in one world. If you can’t find an international festival to attend, consider hosting one at your school…with help, of course! Look for festival planning tips in upcoming Attentionology blogs. Remember, you don’t need to be a magician to work magic in instructional settings! Talk with you next Monday – Attentionology for K – 5 Teachers. 1 Pings/Trackbacks for "International Festival of Attention-Grabbers – Korea"